I made these earrings using black ceramic hearts with siam colored Swarovski accents on a stainless steel wire. 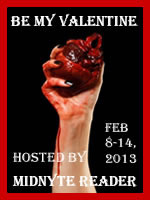 I thought black hearts were appropo of a Valentine's Horror event. ~This is a fast contest! Ends Wednesday, February 13, 2013 at 12:15 a.m.
Hmm. Im pretty simple. Id want to stay in, snuggle up with a romantic movie and just enjoy being with my hunny. I want to exchange gifts when my boyfriend comes to bed early in the morning, after his nightshift. And when I come home, he will be taking me out. Dinner and a movie makes me happy. Honestly I am not really fan of Valentine's day. I have my birthday the next day and these days I only wonder what to do for my birthdays.